Obituary for Mae Arlene Carey | Gaschs Funeral Home, P.A. 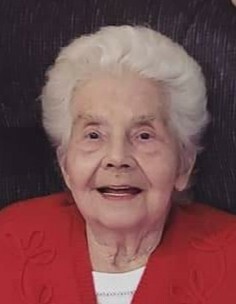 Mae Arlene Amelia Carey (nee Meyer) of Lanham, Maryland passed away on January 14, 2019 at Washington Hospital Center in Washington, D.C.
Born on May 25, 1926 in Warrenton, Missouri, the eldest daughter of Hugo Charles and Adeline Fredericka Meyer (nee Groeper), Mae attended public schools and graduated in May 1944 from Warrenton High School. After passing a typing test in Mr. Foster's class given by a U.S. Treasury official, Mae graduated and left Warrenton on June 6, 1944 from Blue Moon on a Greyhound Bus to St. Louis and then (2 days) on to Washington, D.C., arriving on “D” Day. Mae worked with other government girls as a Clerk Typist, becoming a Cash Accounting Clerk at the Main Treasury Building where she made up the cash payrolls for different government agencies. During this time, Mae rented a room in a private house on N Street in Washington, D.C. In 1946 she moved to Hyattsville, Maryland to live with her friend from the Treasury department, Kitty Mann, and her parent's. Kitty introduced her to Charlie Carey who lived across the street. They were married on November 1, 1947 at First Methodist Church in Hyattsville by Rev. Edgar Beckett. In 1949 Mae and Charlie bought a house in Viers Mill Village in Wheaton, Maryland. She was active in Cub Scouts as Den Mother, Viers Mills Wheaton Legion Auxiliary member and also involved in Education as a 2nd grade Sunday School Teacher at Millian Memorial Methodist Church. In 1961 they moved to Lanham, Maryland and joined Lanham United Methodist Church where she worked in Education as a Teacher and served as Superintendent of Study, Children's Coordinator and also on the Worship Committee. On March 1, 1971, after being a homemaker and raising 5 children, Mae went back to work as a Secretary for the U.S. International Trade Commission. She retired on August 1, 1986. She then helped run The Thrift Shoppe and coordinate Flea Markets at their church. Mae and Charlie took Square Dance lessons in the 1960's and danced with many clubs for almost 30 years. They enjoyed traveling overseas with both their Square Dance and Church Families along with yearly trips across the country for USS Bisbee Coast Guard reunions. They also enjoyed trips to Florida in the Winter and to Ocean Pines, Maryland in the Summer. Mae's favorite pastimes were playing cards with her family and many fun games at family reunions. Mae was predeceased by her loving husband, Charles C. Carey. They celebrated almost 60 years of marriage before his passing on March 31, 2007. She is survived by her children, Charles Michael Carey (Kathy); James Bradford Carey (Patsy); Stephen Douglas Carey (Faith); Deborah Lynn D'Amico (Jim); and Allan Meyer Carey along with many loving grandchildren, great grandchildren, nieces and nephews. She is also survived by her sister Violet Hansen, sister Verneal Minderman (Richard), and brother in law James Carey (Pat). Friends may call at Gasch’s Funeral Home, P.A., 4739 Baltimore Avenue, Hyattsville, MD on Monday, January 21st, 2019 from 4-8 p.m.
A funeral service will be held on Tuesday, January 22nd at 11 a.m. at Lanham United Methodist Church 5512 Whitfield Chapel Rd, Lanham-Seabrook, MD 20706. Interment immediately following service at Fort Lincoln Cemetery 3401 Bladensburg RD. Brentwood, MD 20722. In lieu of flowers please make donations to Lanham United Methodist Church 5512 Whitfield Chapel Rd, Lanham-Seabrook, MD 20706 Please note Mae Carey for Altar Guild. In lieu of flowers please make donations to Lanham United Methodist Church. Please note Mae Carey for Altar Guild.